When savers worry about risks to their wealth, initial thoughts likely turn to inflation, health-care expenses, and market risk — but there’s another that’s often overlooked: creditor risk. Establishing a plan to protect wealth from potential creditors is an important part of a comprehensive financial plan. Individuals who have built up sizable savings and investment accounts, or equity in their home or business, should consider ways to protect those assets from a lawsuit, civil claims, or bankruptcy proceedings. A significant percentage of household wealth is held in retirement plans and individual retirement accounts (IRAs). It’s important to understand how retirement assets may be protected — or exposed – to potential creditors. Retirement accounts generally provide some level of asset protection. For example, under federal law, ERISA-qualified retirement plans such as 401(k)s, profit sharing plans, and defined benefit plans are afforded full protection from creditors, with some exceptions (Qualified Domestic Relations Orders (QDROs), IRS tax levies, and certain criminal proceedings). 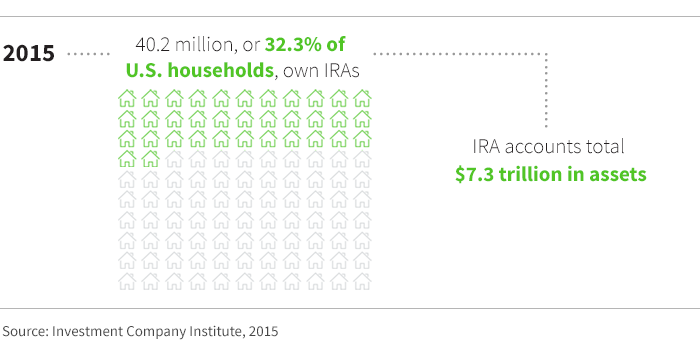 About one third of all U.S. households own IRAs. Industry-wide, assets in these accounts total $7.3 trillion, according to the Investment Company Institute. Yet IRAs (including the SEP IRA and SIMPLE IRA) don’t benefit from the same broad protection that qualified retirement plans have with ERISA. In 2005, President George W. Bush signed into law the “Bankruptcy Abuse Prevention and Consumer Protection Act” that extends federal protection for assets held within IRAs – but only when the account owner files and qualifies for bankruptcy under Chapter 7 of the federal court system. In the case in which federal bankruptcy proceedings do not apply, these assets receive no creditor protection under federal law. The good news is that a majority of states maintain their own statutes protecting IRAs from creditors. 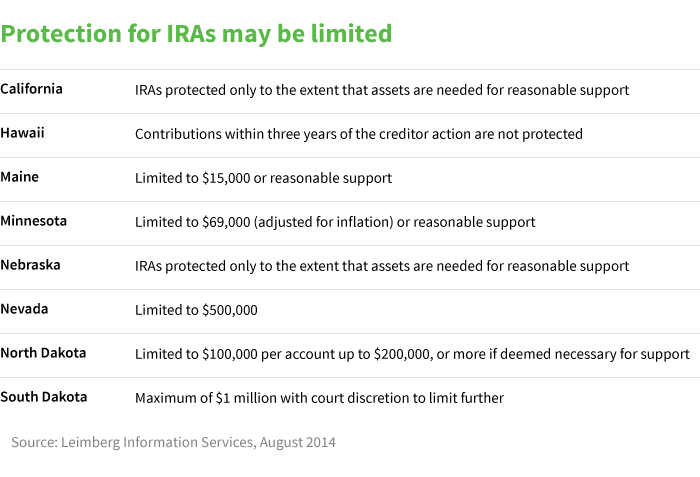 However, there are a few states that limit protection for IRAs. Additionally, while certain states protect traditional IRAs, it’s unclear whether this protection applies to Roth IRAs, such as in Georgia, Montana, and Mississippi. Individuals with even modest assets have reason to consider asset protection strategies. Claims and lawsuits from car accidents, personal injury on property, and liability involving family members can place their assets at risk. Because strategies can be complicated, individuals may want to consult with a qualified tax or legal advisor to understand their set or risks and the strategies that may be appropriate. Retirement savers with significant creditor risk (business owners or medical professionals for instance) who live in one of the states which limit protection for IRAs, may want to consider holding retirement assets within an ERISA plan such as a 401(k) instead of an IRA if possible.